Reprint. Originally published: New York: World Publishing, 1969. In the light of the moon, a little egg lay on a leaf. 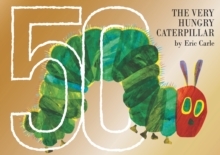 "Every child should have a copy" - Daily Telegraph2019 marks 50 years since The Very Hungry Caterpillar first munched his way through a variety of delicious food and into our hearts. You can celebrate this incredible milestone with this golden jacketed limited hardback edition of the original classic story, featuring bonus content:* The story of the making of the classic* A letter to the reader from Eric Carle himself Since its first publication in 1969, The Very Hungry Caterpillar has now sold over 50 million copies worldwide and has been translated into over sixty-two languages.